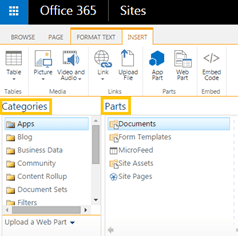 Follow these steps to add a web part to SharePoint online site. You must have ‘edit’ permissions to edit the site page and add the web part. Make sure site page isn’t checked out by any other user and is available for editing. Go to your SharePoint online site. Click the Page tab available on the top of the page. Under the page tab – click Edit. Note: If the Edit option is disabled, you may not have the permissions to edit the page. Please contact site administrator. Click on the area where you would like to add your web part. Select a web part category under Categories e.g. Apps. Select a web part you want to add to the page e.g. Documents and then click button Add. Select the web part and click on drop down menu available on top right of the web part to edit the properties, such as layout. When you done with editing the page. Click Save under the Page tab.